Modern style and effortless sophistication are paramount at Nineteen800 in Cupertino, CA. We offer incredibly spacious, urban-inspired 2 to 3 bedroom condos and townhouses for rent, each one furnished with Energy Star appliances, quartz countertops, European-style cabinetry, hardwood-style flooring, in-home washers & dryers, and much more. Nineteen800 apartments provide a pet-friendly environment with community amenities perfect for residents with an active lifestyle. They include a fireplace lounge, fitness center, private cinema, deck-level pet park with pet shower and much more! Our apartments are also conveniently located near Interstate 280, Cupertino schools, entertainment centers and retail shops. Call today to schedule a tour at Nineteen800 in Cupertino, CA and discover the perfect fit for your live-work-play lifestyle. Train indoors around-the-clock in our fitness center and visit our multi-purpose room for group fitness classes, yoga, or whatever gets your body moving. With a range of restaurants to choose from, you can dive into familiar Asian cuisine or indulge in decadent desserts. Your taste buds will thank you. Window shop, get inspired, or find that special gift for that special someone. Name-brand stores and local boutiques are just steps from your front door. Forget the bus. Ditch the bike. 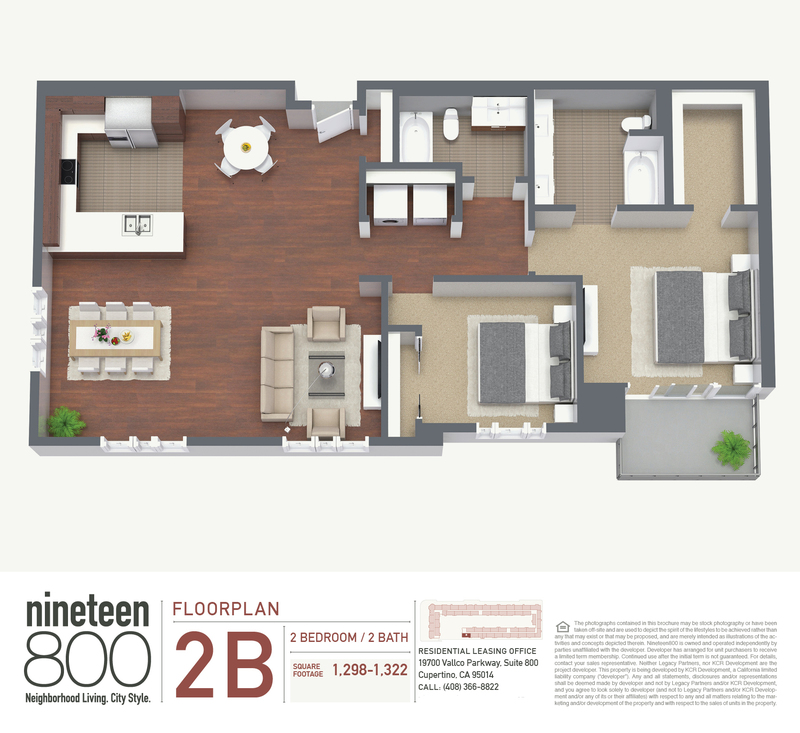 At Nineteen800, you can choose the floorplan that fits your professional needs so that work is never more than a short walk away. Welcome neighbor! Community matters here, and so do you. You’ll feel right at home at Nineteen800, so kick off your shoes and stay a while.